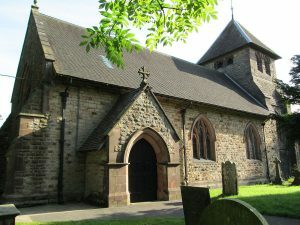 MARTHA KIRKHAM had two daughters baptised in the Staffordshire village of Meerbrook in 1809 and 1812. We have not found her own baptism there. There were many Kirkhams in Meerbrook and also in the town of Leek three miles south. Both groups favour the same set of biblical names and are probably closely related. 1789 Dec 23 Martha daughter of Isaac and Mary Kirkham. Her mother’s name was Mary Mayer, also of Leek. Martha had one older sister, and possibly a younger brother who died in infancy. Her father died when she was 16. She was 19 when she had her first baby out of wedlock. This was followed three years later by another one. It was not uncommon for a bride to be pregnant at the altar, but to have two children out of wedlock was unusual. It may be that Martha was of loose morals, even a prostitute, or she may have been taken advantage of by an employer or relative. We do not know whether she moved to Meerbrook before or after she became pregnant. Her grandparents lived in Meerbrook, so it is possible that she moved there to live with relatives. Meerbrook is a village on the edge of the Peak District. Its growth was fostered by the medieval wool industry, brought to the area by the Cistercian abbey of Dieulacres. There was also coalmining there from the 1600s. We do not have a burial for Martha Kirkham senior nor have we found her in the 1841 census. It may be this Martha Kirkman who married in Leek in 1814. 1814 Nov 7 Abraham Tunnicliffe of the parish of Alstonefield and Martha Kirkham of this parish Spinster. Both groom and bride sign with their mark. The witnesses are Francis Hilliard and Ralph Tunnicliffe. Abraham had previously married in Alstonefield in 1797. Abraham and Martha had one child baptised in Leek. 1815 Aug 13 Hannah daughter of Abraham and Martha Tunnicliffe of Leekfrith, Labourer. There is an 80-year-old Abraham Tunnicliffe living in Alstonefield in the 1841 census. There are three others in the household, including Sarah Tunnicliffe aged 55, but no one who appears to be his wife. Sarah may be a daughter from his first marriage. We have found no Martha Kirkham or Martha Tunnicliffe of the right age in this census. We conclude that she died before 1841.